That’s right folks. The video that pumpkin head said didn’t exist does and is now being entered as evidence in Alexander Lisi's extortion trial. Happy Halloween cracker. Ya got to remember, two credible journalists said they watched the video,. They didn’t just make that up. 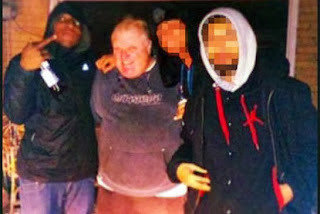 The Globe and Mail claims the Ford family has a history with drug dealing. Rob Ford's brother in law has been charged with breaking into his home and uttering threats. This is the same drug dealer that in 2012 Rob Ford asked the judge not to send to jail. Gee I wonder what he had on Ford. As one blog reader who sent in the links said, no one could even make this sh*t up. Sounds like the Ford dealer shirts from Surrey Shirts will make great stocking suffers this Christmas. CTV is reporting yet another drunken episode involving Rob Ford that was described in an internal e-mail on saint Patrick's Day 2012. This is a consistent behavioral pattern with Rob Ford which simply proves the majority of Canadians are insane and have no moral conscience for reelecting the bum. CNN International has picked up on this story, meaning that what was heretofore only Canadian embarrassment over the drunken, drug fueled antics of this obese buffoon is now world wide. Close to 2 minutes of airtime. Ford is using the classic "I can't comment because it's before the courts" excuse. It's now on BBC Worldwide as well, 2:30 of international airtime. This story is not going away on media outside Canada, being discussed (as opposed to just reported) on FOX news (International) right now.